Over the years we have enjoyed solving our clients’ problems with unsightly embankments. The first aspect to solve is to control erosion and make sure water flows through, under or around the area correctly. Sometimes a retaining wall or terracing is needed, but often the area can be stabilized with plantings which can be very attractive. One advantage of embankments, particularly when you are looking up at the slope, is that the elements of the design are very noticeable. 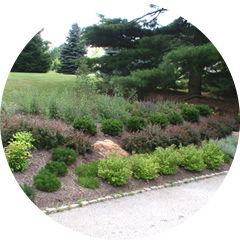 The designer can let loose with sweeps of plantings, color combinations, and create a changing look through the seasons. Call us today to set up an appointment with a designer who will look to convert your problem slope into the showpiece of your property.